This entry was posted in 2012 and tagged 2012, dave, ed, tim, victoria. Bookmark the permalink. Ed, I’m sure Fran would be quite happy to slay you! On a side note: first comment! 30-35k is a worthy goal and I agree — as long as you had fun, it’s definitely worth it. Oh well. It’s still an awesome word. Oh, and GO TIM! ;D I like smiling Tim better than sad Tim. He looks so excited. I hope it’s great news! No. NO. Tim is smiling… This can’t be happening! It’s all a dream! 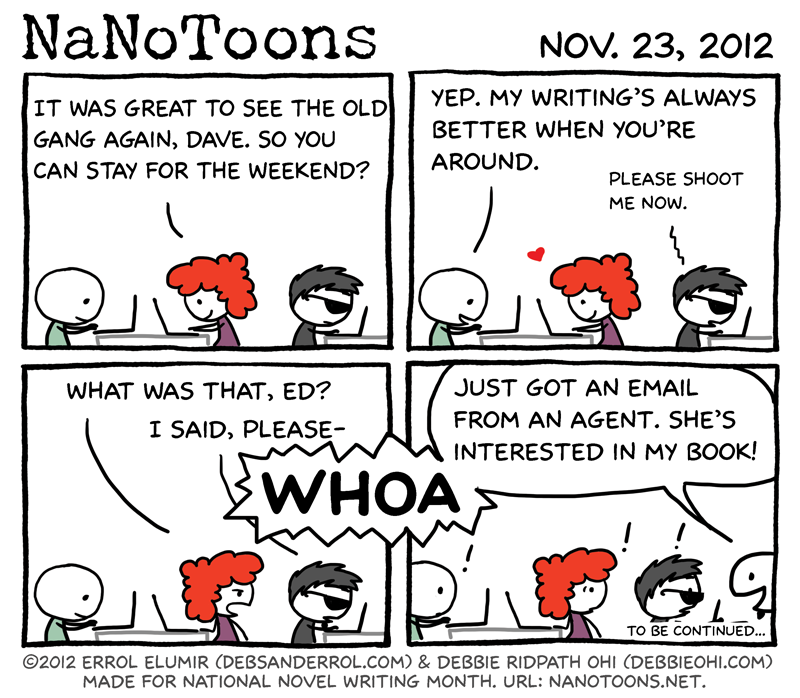 All of NaNoWriMo is one great big horrible dream! NOOOOOOOOOO…. Good luck with the writing this weekend, Estrangelo! I totally agree! 🙂 I like Tim! If Snoopy can get an agent interested in his novel, there’s hope for us all! I’m on track for finishing NaNo, but my novel won’t be done. It took me half the month to actually come up with a plot, and I’ve written 2 scenes multiple times (one of them, after writing again, I realized the first one was still better). I guess it’s my version of editing, but not deleting. I’ll have to learn some serious self-discipline to keep writing regularly after NaNo, because I really want to finish this novel and see what I can do with it. Hm, that may have been too much information for a web comic comment. In closing, I’ll just say that I really like Dave and the way he is with Victoria. I was very happy to see him show up. *laugh* there’s no such thing as too much info in commenting, or too much commenting! I love how Dave seems completely unconcerned by Ed. Yay for Tim! I can’t believe it’s almost over. I don’t want it to be. Go Tim! You deserve it, buddy! And Debbie, at first I thought you were saying to aim for 250,500 words in a day! Silly me. xD I’m thinking that maybe I should set a small goal and keep writing, since I’m on the forums and that probably means I write more words than I think… although, to novel I may have to give up the forum-ing and other online-ness, which I don’t know if I can do since it’s practically my entire social life… -_- Never mind, I can always finish next month. Oh, I check that as well! It’s awesome! 😀 Is it daily all year, or just November?